Removal ProcedureRemove the battery tray. Refer toBattery Tray Replacement.Remove the transmission range select lever cable and bracket. Refer toRange Selector Lever Cable Bracket Replacement. 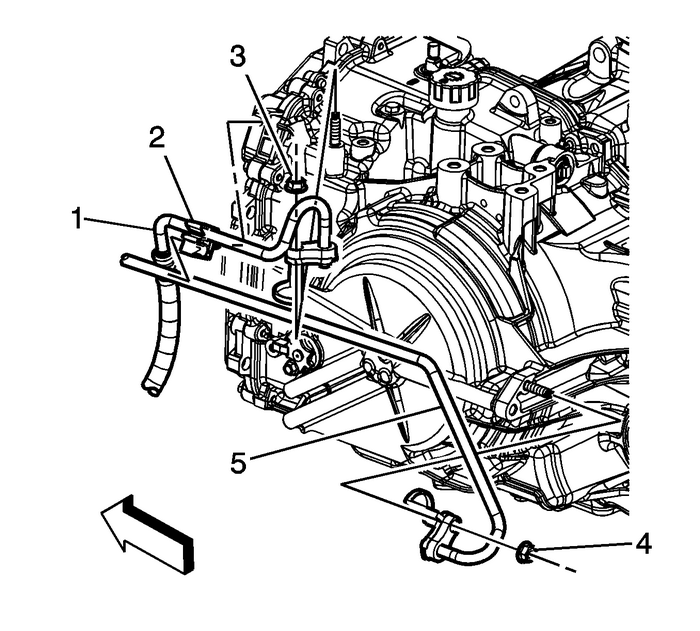 Remove the left transmission mount bolts-(1) from the transmission.Drain the transmission fluid. Refer toTransmission Fluid Drain and Fill. Disconnect the control valve body transmission control module (TCM) electrical connector-(1). Remove the oil cooler inlet-(1) and outlet-(5) hoses from the retainer-(2) on thecontrol valve body cover.Remove the transmission fluid cooler inlet hose nut-(3) from the transmission.Remove the transmission fluid cooler inlet hose-(1) from the transmission.Remove the transmission fluid cooler outlet hose nut-(4) from the transmission.Remove the transmission fluid cooler outlet hose-(5) from the transmission.Plug and/or cap the hose and transmission to prevent contamination. Remove the upper transmission to engine bolts-(2).Remove the frame. Refer toDrivetrain and Front Suspension Frame Replacement.Disconnect the wheel drive shafts and intermediate shaft from the transmission. RefertoFront Wheel Drive Shaft Replacement.On AWD equipped vehicles, remove the transfer case. 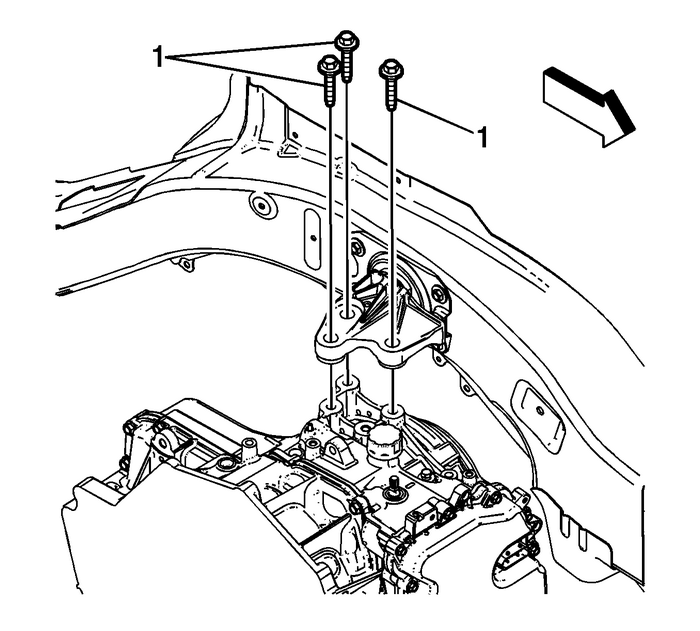 Refer toTransfer Case Assembly ReplacementRemove the rear transmission mount bracket from the transmission. Refer toTransmission Rear Mount Bracket Replacement.Remove the front transmission mount from the transmission. Refer toTransmission Front Mount Replacement. Remove the starter. 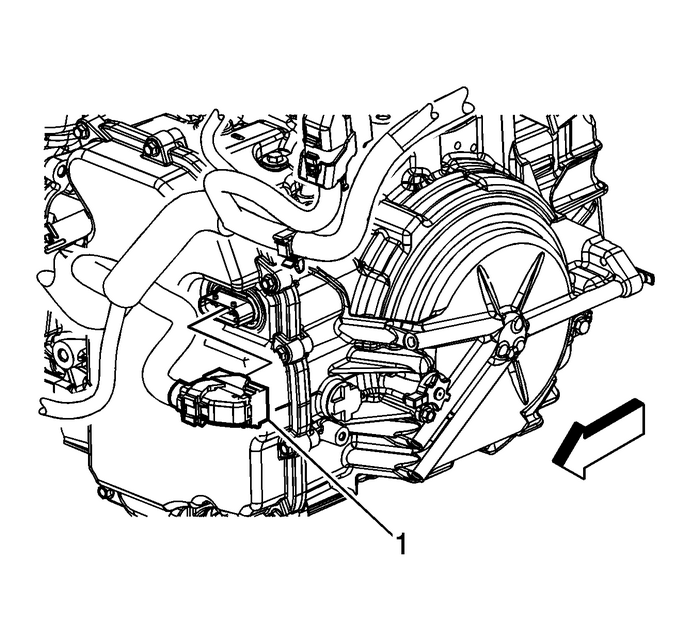 Refer toStarter Replacement.Mark the relationship of the flywheel to the torque converter for reassembly.Remove the torque converter to flywheel bolts-(1).Use a transmission jack in order to support the transmission. Remove the remaining transmission bolts-(1,-3,-4). Install the transmission bolts-(1,-3,-4) and tighten to 75-Y (56-lb-ft).Remove the transmission jack. Install the torque converter to flywheel bolts-(1) and tighten to 60-Y (45-lb-ft).Install the starter. 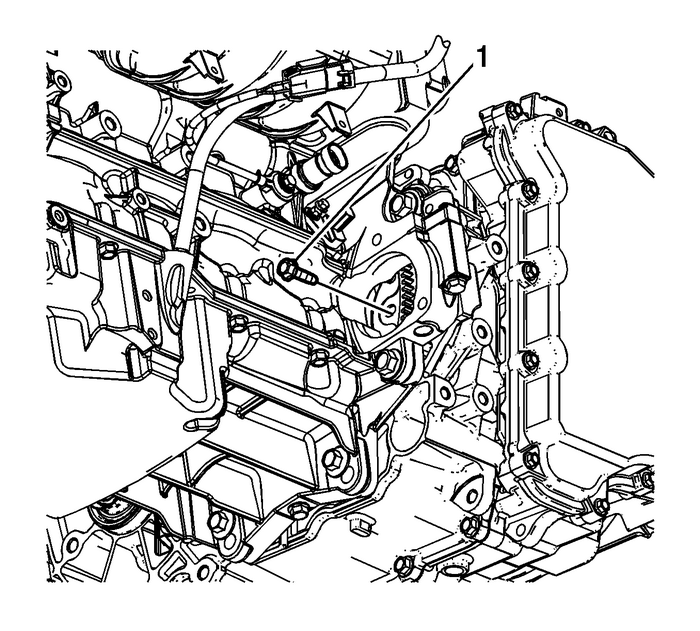 Refer toStarter Replacement.Install the front transmission mount to the transmission. Refer toTransmission Front Mount Replacement.On AWD equipped vehicles, install the transfer case. Refer toTransfer Case Assembly Replacement.Install the rear transmission mount bracket to the transmission. Refer toTransmission Rear Mount Bracket Replacement.Install the intermediate drive shaft and wheel drive shafts to the transmission. RefertoFront Wheel Drive Shaft Replacement.Install the frame. Refer toDrivetrain and Front Suspension Frame Replacement. 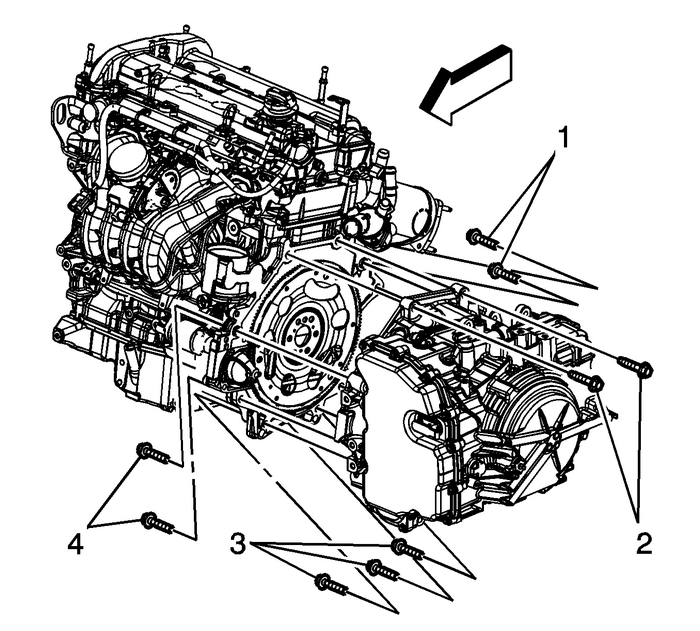 Install the upper transmission to engine bolts-(2) an tighten to 75-Y (56-lb-ft). Install the transmission fluid cooler outlet hose-(5) to the transmission.Install the transmission fluid cooler outlet hose retainer nut-(4) and tighten to22-Y (17-lb-ft).Install the transmission fluid cooler inlet hose-(1) to the transmission.Install the transmission fluid cooler inlet hose retainer nut-(3).Install the oil cooler inlet-(1) and outlet-(5) hoses to the retainer-(2) on the controlvalve body cover. Connect the control valve body TCM electrical connector-(1).Install the transmission range select lever cable and bracket. Refer toRange Selector Lever Cable Bracket Replacement.Install the battery tray. Refer toBattery Tray Replacement.Adjust the automatic transmission range selector lever cable. Refer toRange Selector Lever Cable Adjustment.Fill the transmission with fluid. Refer toTransmission Fluid Drain and Fill. Install the left transmission mount bolts-(1) to the transmission and tighten to57-Y (42-lb-ft).If a NEW TCM has been installed into the vehicle, the NEW module needs to be reprogrammed.Refer toService Programming System (SPS). Transmission internal service/overhaulValve body repair or replacementControl solenoid valve assembly replacementTCM software/calibration updateAny service in response to a shift quality concernPerform the Transmission Adaptive Values Learn procedure. Refer toTransmission Adaptive Values Learn.Road test the vehicle.